During the 2011-2017 California drought, lots of media attention was focused on one of the largest consumer of water in the state: almonds. Fueled by a boom in health-minded consumers and a climate well-suited for almond trees, almonds have quickly risen to become one of the largest and most lucrative agricultural products in California. But exactly how sustainable and environmentally-friendly are California almonds? Almonds are currently one of the biggest cash crops in California, producing as of 2014 over 80% of the global almond supply (Pierson, 2014). Their rise into prominence has come from a variety of factors. 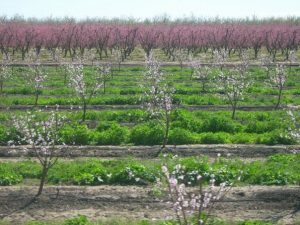 For one, the climate of California’s Central Valley is the ideal for growing conditions of almond trees (CBC News, 2016). Demand for almonds as a healthy, crunchy alternative to many snack foods has also risen over the past decade, both domestically and abroad. In fact, seventy percent of California’s almond crop is sent overseas, making it the largest agricultural export in the state (Pierson, 2014). With all of that demand has come a host of wealth for California farmers, but not without its share of environmental costs. By far the largest is water use, something that is already a hotly contested resource in the American West. Almonds are water-guzzlers, needing around 2 liters of water for each kernel (Fulton, 2018). Compared to many of the other food crops that could be grown in the region, almonds have a very high water footprint (Nowakowski, 2015). This on its own wouldn’t warrant almonds’ bad reputation compared to many of the other thirsty crops grown in California, such as grapes and alfalfa. The problem arises from differences in their management. Unlike other crops, almonds must be grown year-round, requiring constant water input. Typical crop fields can run fallow for a year and be fine, but almond orchards can’t recover the same way. A few months without water and the trees die. A farmer that has invested his or her money into an almond orchard is not going to want that investment to go to waste and ends up having to rely on groundwater from wells to provide for the crop. What’s worse, the high price of water drives farmers towards planting even more almond trees in order to turn a profit because the crop is so lucrative. This vicious cycle is depleting California’s groundwater reserves at a massive rate, only exacerbating the water crisis (Plumer, 2015). Another major impact that the almond industry has on US agriculture comes from its pollination. While there have been some efforts to genetically engineer self-pollinating almond trees, almond farmers largely rely on bees to pollinate their crops. This has spawned a cross-country pollination business for American beekeepers, which helps them to support their struggling honey business (Smith, 2017). This financial interdependency of beekeepers and almond farmers does come with challenges, as the traveling can increase the bees’ chance of exposure to diseases and hive theft can rob a beekeeper of their livelihood (CBC News, 2016). So, what is the solution here? Will the higher revenue from the almond crops give Californians the cash they need to invest in better water management? Or will the state fall into an irreversible feedback loop of water loss forcing farmers to grow more water-thirsty almonds? Can local bees get a boost from providing them with more habitat closer to almond orchards (Klein, 2012)? Or is this all being extensively overblown and scapegoated (Gonzales, 2015)? No matter the case, perhaps you should think twice before choosing almonds as your healthy snack of choice.